This morning’s opening general session at Information On Demand 2011 here at the Mandalay Bay in Las Vegas, Nevada, was jam packed, both in terms of stage setting for the rest of the event, and literally in the audience, which filled up much of the Mandalay Bay Events Center. BBC America presenter Katty Kay was our host, and opened morning’s tidings with a wonderful video and photo montage that she provided the voiceover for, explaining how IBM innovations had helped change our world over the past 100 years (remember that 2011 is the year of IBM’s centennial). 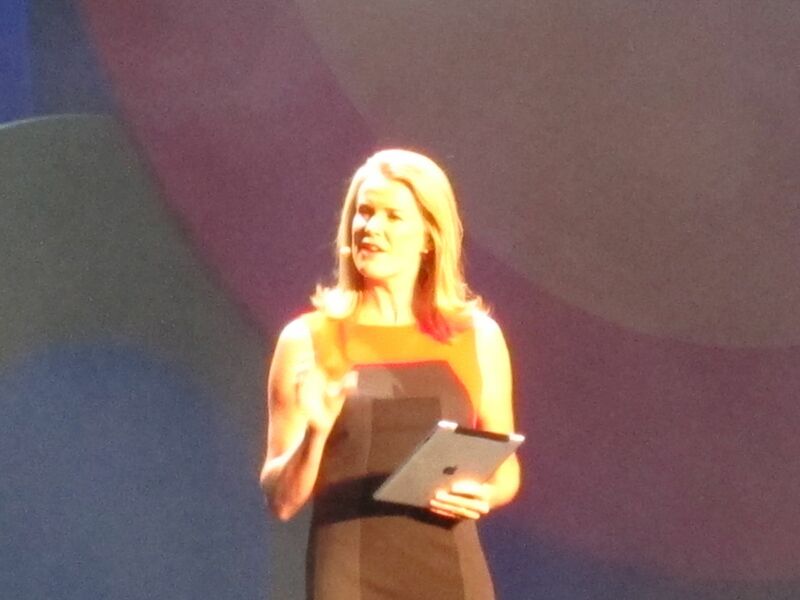 BBC America presenter Katty Kay kicks off Information On Demand 2011 this morning in Las Vegas, Nevada. There were pictures and reminiscing about IBM’s Social Security Administration contract, the early days of data processing, the IBM 350 Ramac, the introduction of sequel databases and CICS, and even a remembrance of the floppy disk. Ah, I remember those well. They make great coasters. Kay explained that the pace of computing has only accelerated, the advent of the Internet and the birth of e-business paved the way to our global connectivity, and the smarter planet initiative from IBM is poised to help companies and organizations around the globe maximize their resources and be more socially responsible. Considering the financial meltdown of 2008, which journalist Kay didn’t gloss over, companies also need guidance and direction to help them with their analytical capabilities, particularly in an age when 1B Tweets are posted a week, and 90% of the world’s information was gathered in only the past two years. 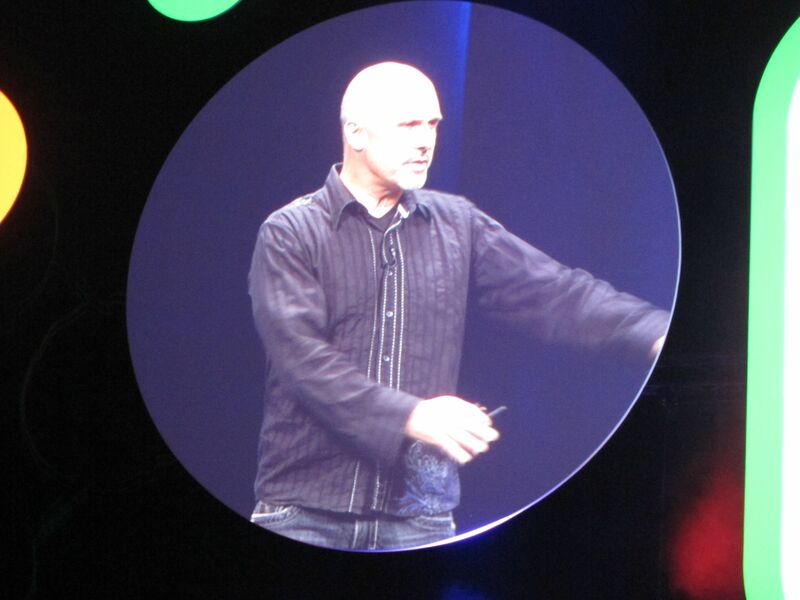 IBM Chief Scientist Jeff Jonas explains the intricacies of information insight vis a vis tabletop puzzles. Jonas explained that organizations are getting dumber as more data arrives, but that that’s not a fait accompli, that it’s not a foregone conclusion that your organization will have enterprise amnesia. He started with the video of a blackjack dealer, who was clearly taking a stacked deck from a player, a dealer whom, if the casino had better information, would have discovered that said customer and said dealer had the same home address. That casino would later go on to get taken for $250K! Here’s a retail example Jonas shared: 2 out of 1,000 employees employed in retail have already been arrested for stealing at the very same store. Yikes! Jonas went on to explain that good information understanding and analytics means context: Better understanding something by taking into account the things around it. He used, as his example, a series of jigsaw puzzles he had his girlfriend’s kids put together, but having strategically taken some of the pieces of each out. Even with the missing pieces, the kids were able to get a picture of what the puzzles were about, revealing necessary context. But until you take the pieces to the table and attempt assembly, Jonas explained, you don’t know what you’re dealing with. And that’s where many organizations are today. Incremental Context provides incremental discovery, and given sufficient observations, there can come a tipping point when confidence improves while computational effort decreases. Put that in your database pipe and smoke it! Next, IBM’s managing partner of financial services, IBM Global Business Services, Sarah Diamond took the stage to explain how dire the banking situation was in 2008-2010. The number of bank failures went from 25 in 2008, to over 157 in 2010. Eventually, the IMF calculated that the banks wrote off $2.2 trillion in toxic assets and bad loans, and emerging from that mess many banks recognized their need to change, to respond to pressure from regulators and their public constituents to better manage risk, and their overall businesses. IBM customer SunTrust, was one of those banks which were better prepared for the crisis than many, in that they had put together a risk analytics and governance regime before the crisis occurred. As their senior VP of risk technology explained, SunTrust went from standardized reporting to client-centric reports delivered via intranet portals in just a few short years, and when the financial crisis hit, SunTrust was prepared to know exactly what their exposures were, what they consisted of, and most importantly, who was on the other end of the transaction. This allowed them to report to senior management on a daily basis at 7 am exactly what their positions were based on their trading partners’ exposures. If only all banks had been so well prepared. That’s “goodbye” in Russia. So I should probably learn hello. Answers.com explained it’s dobro pozalovat. So, dobro pozalovat to Yandex, the Russian search engine, which followed short on the heels of LinkedIn’s IPO and went public earlier today on the Nasdaq, raising some $1.3B (dollars, not rubles). Apparently, the issue was some 17 times oversubscribed, surprising considering that Yandex only has about 64% market share (although it is still the largest Web site in Russia). Is this the beginning of a great Twitter consolidation? When a TweetDeck falls in the virtual Twitter forest, does it even make a sound??? Well, I’m just glad to see someone out there’s making some deals. After watching HBO’s docudrama rendition of Aaron Ross Sorkin’s 2010 book about the financial crisis, Too Big To Fail, last evening, one might start to wonder. The movie’s probably easier to consume in many ways, minus all the boring financial mumbo jumbo details, although it nearly made me ill to replay that denouement from the fall of 2008. But, I have to say, William Hurt made for a wonderful SecTreas Henry Paulson, understated and steely, and James Woods cracked me up as vulgar Richard Fuld, the former CEO of Lehman Brothers. And Paul Giamatti as Fed Chairman Ben Bernanke…another classic performance by Giamatti. The movie seemed to raise a central question: Was Paulson the hero who saved the day or the insider who protected the interests of his industry? You get to watch the film (or read your history book, if you’re so inclined) and be your own judge. But kudos to the HBO team for making a compelling film about what could have easily become a trite and boring re-enactment. It was anything but boring…now, having seen it and completely paranoid, if I could only figure out a way to move all my retirement savings into a small bomb shelter immune from market movements if not the elements! It was a year ago today that Lehman went bust. I was in London that Monday a year ago, parked at our Bedfont Lakes offices near Heathrow Airport. That previous Friday, I had been in the Admiral’s Club at Austin Bergstrom, waiting on the plane that would take me to Chicago, and then on to London from there. While I sat waiting, I remember distinctly a Lehman employee pointedly trying to reassure a client over the phone that Lehman would continue to be a going concern on Monday. But on Monday we discovered his reassurances were ill-fated. Me, while in London and other parts of Europe throughout the next ten days, I felt like a stranger in a strange land…I didn’t know quite what to make of it all. The same weekend, Hurricane Ike had hit the Texas coast and decimated Galveston, and from the shores of the U.K., it seemed like the world was quickly coming to an end. Continuous financial headlines over the course of the next week confirmed the discombobulation. I‘m working from London today, attending meetings at IBM’s Bedfont Lakes location just outside Heathrow airport. I’m about five hours ahead of the opening of the New York markets, and considering the constant stream of seemingly bad news concerning numerous financial services and investment firms over the weekend, I had to laugh to myself when I read that the Wall Street Journal is expected to launch some new social networking and community features tomorrow. I hope there’s still someone around in that industry to sign up for those new community features. Last one out, turn off the Delicious tags! In the case of the Journal, an Associated Press story indicates that with the new Journal site, community members will be able to comment on individual stories, create discussion groups, and ask one another for advice. Actually, it’s very exciting to me to see the major media turn on such features. As I traveled on the Heathrow Express from Paddington Station back to the airport this morning, I had a short 15 minutes to ponder what questions I might like to pose to the Journal’s community using these new features when they become available. I eventually arrived at the following. I haven’t gone back to determine where my money would have ultimately been the safest. I suspect it may have been a toss-up between “C” and “E,” although I hear the South Florida condo market is on the rebound. I eagerly await hearing what our president has to say about the tidings since the year of Lehman’s demise and the onslaught of the financial crisis. Though I tend to think of myself as a financial conservative, I think a healthy amount of regulation is necessary to maintain a level playing field and to keep the bad actors in line. Many have argued regulators failed us by not adequately enforcing the existing regulations, but in an environment where mortgage brokers were giving loans to people not qualified for them like candy to kids on Halloween, I also think the rules moving forward should provide more clarity and transparency to the risk the big financial firms are taking on. 16 to 1 leverage would have been enough to send me running with my money to the exits had I known about it at the time. And I can get 35-1 odds if I roll boxcars (6-6) out in Vegas at the craps table! More on that as I continue my drumbeat about the Information on Demand Conference taking place October 25-29 at the Mandalay Bay in Viva Las Vegas.